Connecting with my Preschooler with Dough Dots! I was sent these products complimentary from the creators of Dough Dots!™ All opinions are my own. I just came home from being away for five days for work. I could not wait to get home and play with my daughter! I missed her. I missed interacting with her. It probably didn't help that I was away at a Children's Museums conference, seeing all kinds of fun exhibits and activities for kids. When I got home I laid out some new play items for us. I was recently sent products from Dough Dots!™to try out with BabyCakes. She loves creating with clay so I knew they would be a hit. We love creative toys that allow her to use her imagination. What makes Dough Dots!™special is the ball packaging. The balls make it super easy for her to open the dough herself, and the package itself is creative, featuring various animals. The balls hold the dough and are toys within themselves. 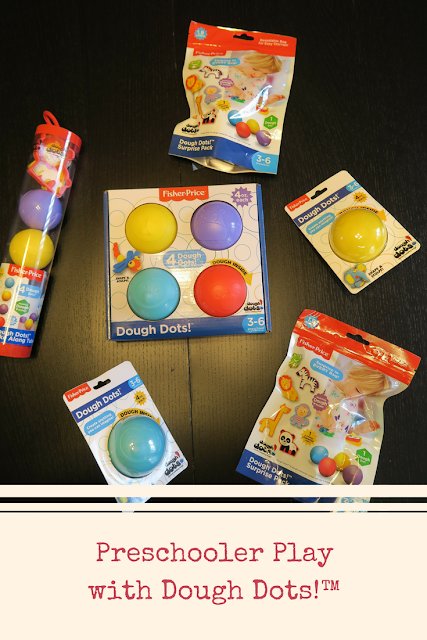 Designed for ages 2 to 6 Dough Dots!™come in four different vibrant colors, and you can get various cutters and molds to kick start play. Even though the balls are easy to open, they close air tight to preserve the quality of the dough. Check out Dough Dots!™today for your child.